He joined my Schipperkes list about two years ago, and he and I chatted from time to time. When we first met, he still had the love of his life, a sixteen year old Schipperke named Skipper. He would call me or write to me with questions about Skipper, his health, etc., and we became quite friendly. In addition, the "fur-family" at the Bruchert's also consisted of two giant bunnies, and two older kitties. When Skipper passed away, he was more than sad, he was devastated. We talked on the phone numerous times, and when I sent photos of a little senior Schip girl I'd rescued, named Katrina, he asked me if he could drive down and get her on the spot. He fell in love with her, and the fact that she was not only a senior (about 12 or 13), but also handicapped, having a deformed foot, and I'd had to have a tumor removed from her side as well, didn't phase him a bit. He and his wife Trish both felt that the seniors were the most special, and he often told me that he'd fallen for Katrina the minute he saw her photo, because all he could think of was what if something happened to him and his wife, where would his beloved Skipper have ended up. So, he and his wonderful wife adopted senior Katrina, from me, a little over a year ago. Good Schip friend Diane Johnson transported her from a dog show down here in L. A., to Northern CA, and Bill was so anxious to get her, I believe he met her late that night, not being able to wait even until the next morning to get her. Then, a few months later, there was an emergency rescue needed, of a little male Schip from a shelter near him, and I'd just asked that he get him from the shelter so he could be transported to me. It turned out that this little boy, named also Skippy, had some horrible health issues, and Bill spent several thousand dollars on his vet care for the few days he had him, trying to save him. Skipper slept in bed with Bill and got all the love and care he'd missed out in his lifetime, all crammed into just a few days, as he ultimately passed away about five days after Bill saved him, from a perforated intestine and peritonitis. Again, Bill was just overwhelmed with grief, even though he'd only had the little guy for a few days. He had hand fed little Skippy and Trish and Bill had become so attached to this little fighter, even though he'd only entered their home a short time before. A week later, the same rescue group in Northern CA who'd told me about Skippy, told me that the same woman who had turned Skipper in, had now turned in a young female Schip. They said the woman was being put in a home with mental problems, unable to care for herself or her Schips, and that this little Schip was terrified and wouldn't let anyone handle her. They were very doubtful of her ability to adapt to a new home, and would only allow me to have her because I was an established rescue, who they'd worked with in the past with success. I told Bill about her, and we talked about it. I told him I felt that she was Skippy's gift to him, thanking him for his wonderful last days of love spent with Bill and Trish. I felt in my heart that this was one of those ironic things that were just absolutely meant to be. And... as it turns out, it was. Bill went and got her, brought her home, frightened and unsure of herself, and she instantly bonded to Trish. This was perfect, as now they each had a Schip to love and Katrina already "owned" Bill, and never let him out of her sight. They named this little tailed Schip "Wicked". They worked very hard with her lack of social skills and she's now a very happy and healthy little Schip, very well adjusted and socialized, and pure trouble waiting to happen. Ironically, I often told Bill that I felt I'd known him my entire life. He was just one of those really super special people who touches your heart, and had nothing but good in him, and neither of us realized until he retired from his job at HP a couple of months ago, and purchased a motor home that was in FL, that in fact, we'd never even met in person. We both had never thought about it, we felt like we'd met, it was so funny to realize we'd never had a "face to face" meeting! SO, when Bill and Trish flew down to FL with their two girls to pick up the motor home and drive it back cross country, we decided we HAD to meet when he came through my area. It turned out, they were behind schedule to make it to their camping site for the evening, and I'd had to go get a little rescue out of San Bernardino that morning, so we literally met "on the road" off of a freeway off-ramp, in a grassy area next to an industrial park. I took little Amy with me, and drove up to where they were, and we met for only about an hour. We exchanged hugs all 'round and then we all sat down in the grass together and played with the Schips and chatted like old friends. Then, they were on their way, with big plans for traveling all over the U.S. in their new Motor Home and their two girls. It's SO hard to believe we only met the one time, and so briefly, as I had grown to feel that Bill was one of my closest friends, and also felt I knew Trish just by association and all the loving things Bill had said about her. We made plans for them to come down in their motor home for the next southern CA Schip-nic, and off they went, so excited about this new phase in their life. He wasn't happy about this, and in fact, had also told his family that instead of giving him a gift for his birthday or Christmas last year, to instead send me a donation. When they contacted me to abide by his wishes, I again referred them to Sandy's Rimrock and the SCA rescue fund. Not happy with just doing that though, Bill, unbeknownst to anyone, has quietly helped out several people over this past year, who have had sick Schips, or needed help with vet bills, etc. He only told me about this about a month ago, we were talking about what "charity" means to us, and how we all choose our own types of charity, and he told me that he'd decided his "charity" were Schipperkes, and he was going to go on anonymously helping out Schips in need, as this was where his love lay. He was determined to continue on doing this for as long as he lived. He told me that he had all he would ever need, and even though he wasn't super rich, he was very comfortable, and again, he had loved his little Skipper dog so much, and now Katrina who was the light in his day, that he wanted to make sure that no Schip, especially a senior Schip, would have to go without help if he had anything to say about it. He loved his "girls" SO much, he would often call me to just tell me that Katrina was lying by his side, four feet in the air, with a smile on her face, getting belly rubs, or to tell me about some new horrible mischief that little Ms. Wicked had been up to. I'm sorry to make this so long, but being able to write this all down is giving me a little bit of closure, as he was such a wonderful man, and I'm still in shock over the phone call I had an hour ago. Bill's daughter and son have come to CA, town and they are making arrangements for a small, simple memorial ceremony to be held in his honor on Thursday, at his home in Los Gatos, CA. I am planning on driving up there for it, as long as my poor old Miata is game for the trip. I was so jolted by his daughter Heather's phone call, and here, she had lost her beloved dad, and she was comforting ME! I can tell she is cut from the same cloth as Bill. She dropped a second bombshell on me after she told me of Bill's passing. In lieu of flowers, they are asking that donations be made to my rescue, as that was what she felt her father would have wanted. Even though I'm not "officially" a non-profit organization, she doesn't care, she is asking all friends and family members to do this, and begged me to allow them to do so. Anyone who knows me at all, knows I don't take charity, and turn down donations all the time. But this is something special, and in fact, is motivating me to do some organizational things I should have done a long time ago. I have agreed to take the donations, and plan to use "Bill's money" to get things in order to take the next step in rescue, and to make sure that Bill won't have to worry about any Senior Schips going without help when they need it. 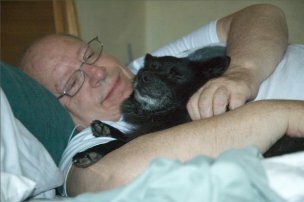 In addition, I plan to contact an attorney and have the paperwork drawn up for non-profit status for Angelsgate, and also, secondarily, I hope to establish a fund, in Bill's honor, for Senior Schipperkes who need help with medical bills, etc. This will take a long time to finalize, but maybe by next year this time, this will all be on the way to become a reality. I have one huge favor to ask all of you who enjoyed Bill's posts about his "girls" and his wonderful photos of a smiling Katrina and happy Wicked and his giant bunnies and kitties, and last but certainly not least, his lovely wife Trish. Please send me emails to forward on to his family, so they will see how important he was to all of us. I told her how he'd touched many more Schip people than just myself, and I'd like to be able to show her how much we're all going to miss him. I'm very very sorry to go on for so long, but what I've said about Bill above, is just the tip of the iceberg. This sweet, gentle man truly loved his family and his fur kids, and he wasn't ashamed or embarrassed to show anyone or openly demonstrate his love for all of them. I'm attaching the montage of photos that brought Bill to fall in love with little Katrina and adopt her into the best Schippy home ever. I lost all my retained files about a month ago when AOL had problems, so I don't have any of the photos that Bill sent to us of Katrina and Wicked. If anyone has these, I'd really appreciate it if you could send them to me so I can share them with his daughter and wife. I have many more "Bill stories" of charitable things he's done, but have already said more than enough, I'm sure you'll all, in our little Schippy family, understand. Thanks so much for indulging me, and hugs to all of you, hug each other, and especially, hug your Schips! Special Dogs for Special People for Over 30 Years!